Welcome to Barnett's Furniture Transport, a family owned furniture removalists business, providing professional furniture storage and removal services to our valued customers in Adelaide Hills, including the areas of Mount Barker and Murray Bridge. At Barnett's Furniture Transport we understand the complexities involved with moving, and offer a full range of services to make your relocation experience an enjoyable and "stress free" one. Our friendly furniture removalists have the skills, know-how and experience required to keep your belongings safe and sound. Whether you are moving across the street or across the country, our professional and very friendly staff are able to assist you in every step. 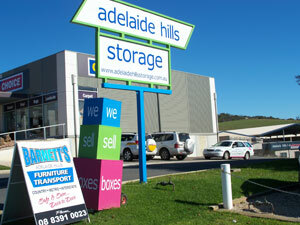 Our relationship with the Adelaide Hills Storage Centre ensures our customers receive quality storage options that are considered the best in the entire region. As a family business we believe in exceptional customer service by applying "old fashion values" in all aspects of our service to you. With a fully trained staff comprising over 100 years’ service in the removal industry, Barnett's are very proud of our outstanding record of "damage free", yet cheap furniture removals and exceptional care of our customers furniture that is second to none. With Barnett's you will always be "SAFE & SURE .....DOOR TO DOOR". To find out more about our range of services, please call our friendly staff members now. You can call us on 08 8391 0023 or get in touch with us via email at barnettsft@internode.on.net and we will get back to you as soon as possible.